Another day, another all-time high for the BTC-USD markets. 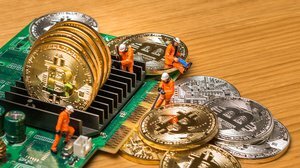 Bitcoin has been on a strong bull run since its bottom in the $1800s and, despite many technical indicators, has pushed to new highs, week after week. With the international uncertainty surrounding the North Korean conflict and the recent news of Dalia Blass’s recent hire at the SEC, there is plenty of bullish news to fuel the push. 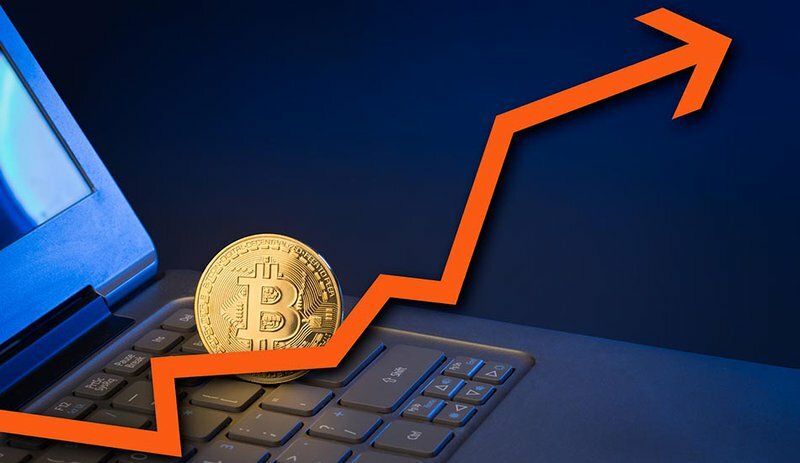 However, the current BTC-USD all-time high resides in the lower $4800s, which many market analysts say is the local top of this run. Typical Fibonacci Extensions are 127% and 160% of the total length of the bull run. 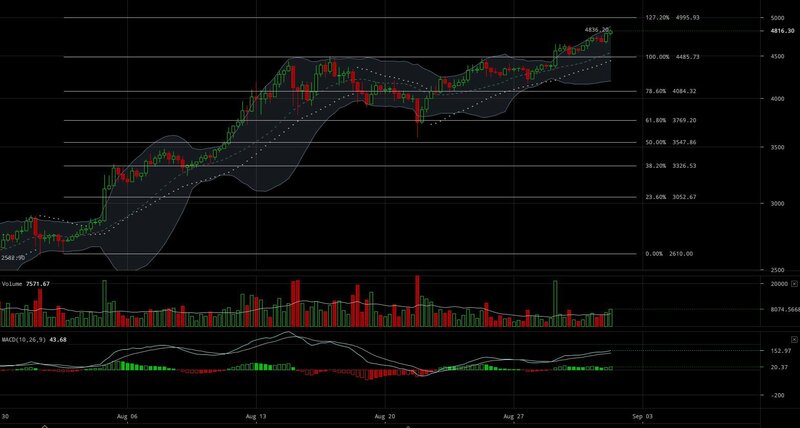 $2600 (0% retracement value shown above) marks the breakout point of the current bull market BTC-USD is experiencing. There have been 4 attempts made to break the $4480 values (100% retracement value shown above). 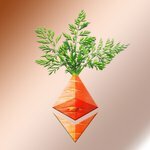 Due to the prolonged effort to break these values, we can make the argument that $4480s are the local top values; any values that breach beyond the $4480s are extensions of the bull run. The Rising Wedge is characterized by higher highs and higher lows that converge about an ascending value. For anyone trading reversal patterns, it is paramount to confirm the breakout before entering a position. In low confidence patterns like Rising Wedges, we must wait for a breakout below the wedge and for strong trading volumes to increase the likelihood of success. Some evidence that points toward a possible reversal is the RSI and MACD divergence. Divergence is essentially an indication that there is potential bullish momentum loss in the market. It’s important to note that bearish divergence does not guarantee a market reversal and it does not mean the market will pullback. The only thing we are permitted to take away from bearish divergence is the argument that the market has an increased probability of either consolidation or a market pullback. In strong bull markets, bearish divergence can be seen for hours, days and even weeks. In our case, should the Rising Wedge break to the bottom, we can expect an approximate $500 move downward. However, should the pattern fail to break to the bottom, we can expect a price upward to test the 127% Fibonacci Extension values around $5000 before encountering any significant resistance. Global uncertainty surrounding North Korea’s aggression plus ETF optimism give further evidence to support a continued bullish market. 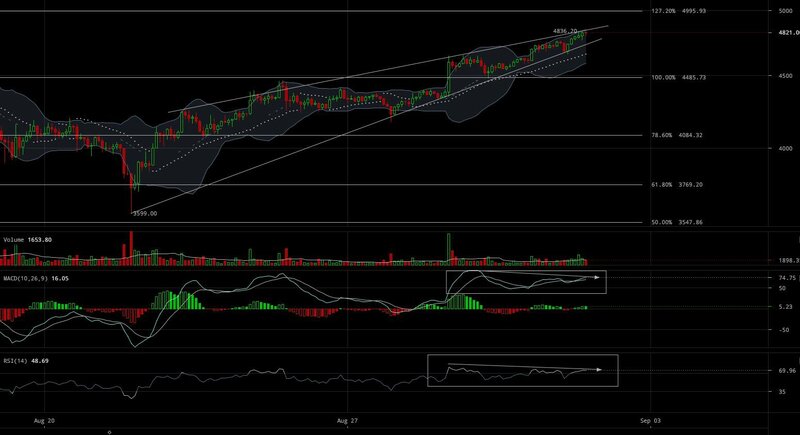 A potential Rising Wedge could potentially cause a $500 BTC-USD market retracement. The pattern has yet to be confirmed. Should the Rising Wedge fail to break to the bottom, we can expect a further push toward the 127% Fibonacci Extension values of $5000.